Sometimes you just need a Cuddly Critter to get the message across! Elephant was perfect for the job in hand (along with some artistic licence!) - to wish a well liked work colleague good luck as she leaves for pastures new. Ambrose King of The Waves. Hello - as you read this I am actually away camping in the Lakes! Oh the power of Scheduled posts! So here is this weeks showcase of a fab Dr Digi image called X-ray Raymond. He's a pretty new addition to the collection and I wanted to use him a bit different to a Get well card or something similar. I think he works well as a "Manly" Valentines or just a note to the other half to tell him he's still got it! If you would like to see more details about this card -Pop over to my Blog and take a look. That's all for me for now - I'm hoping the weekend has stayed dry and I'm not suffering from Hyperthermia when you read this! I made a realy summerfeeling card for you today. Dunderton is feeling a bit tired. So he packed his bag and put all on the car. 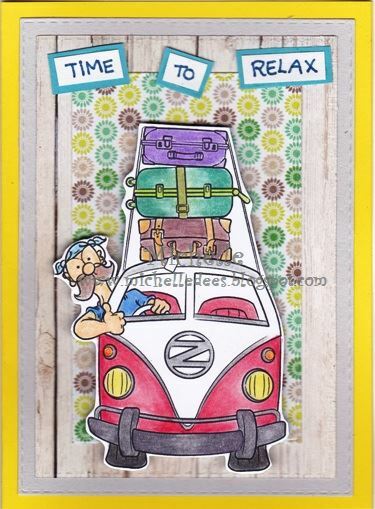 And now he is driving to a nice spot for a relaxing holiday. The image is called SUMMER HOLIDAY. 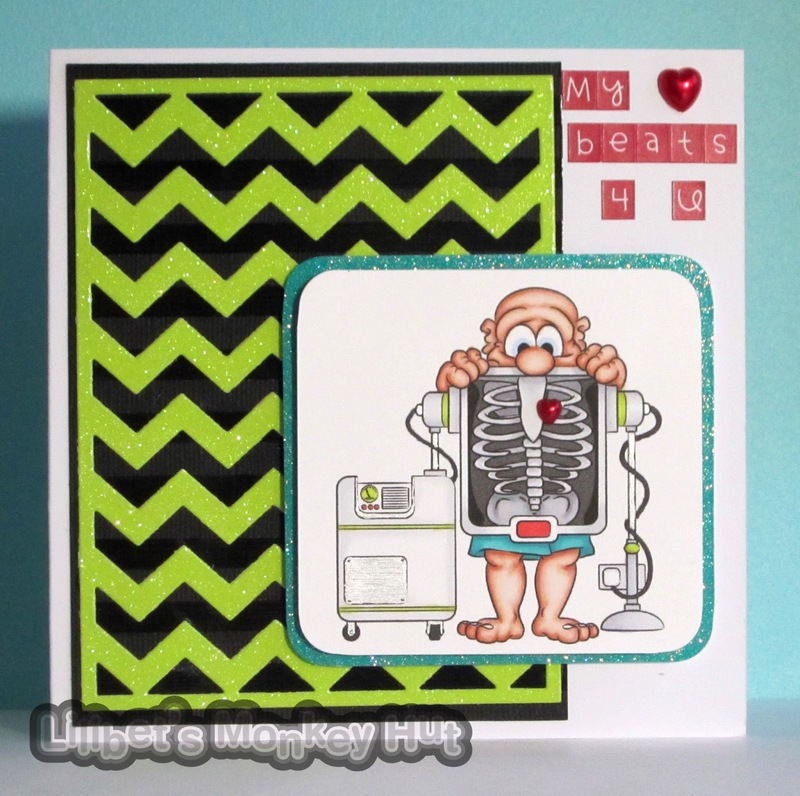 If you like to see how I made this card take a look at my BLOG. Have a nice weekend and see you next time. It's that time of year, pack your bags and go and explore the world, well we can dream can't we. I bet there will be a few of these camper vans heading to Glastonbury this weekend but maybe not too many hankie hat wearing old folk! 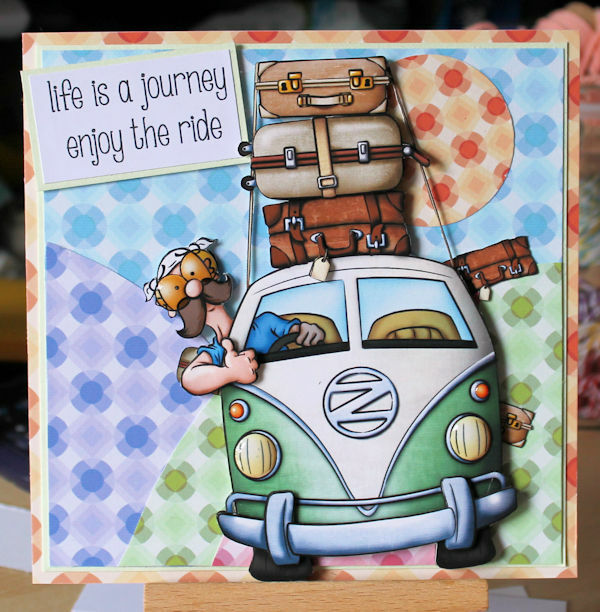 I took the easy route this week and used the pre coloured Summer Holiday image, available HERE, you can find the black and white version HERE, I also used the great new set of papers, Curves and Corners, which can be found HERE. 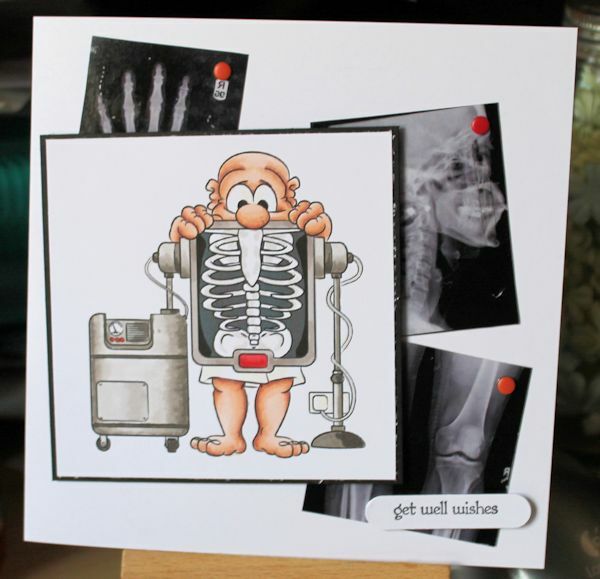 Sometimes you need a great bright card to wish someone a Happy Birthday plus a Dr Digi image of course! Scaredy Duck is one image to use and it's available in the store! This image took me back to the song Rosie Don Partridge and his one-man band. You need have great coordination to play all these instruments at once, sadly I do not! Isn't this a fun image. Morning - again I'm running a little late... I've worked it out though - it's when I work late shifts as I really don't like getting up out of my bed!! I certainly would not appreciate Corporal Clegg yelling at me to do my PTI! I can't express strongly enough how glad I am that I found Dr Digi images. 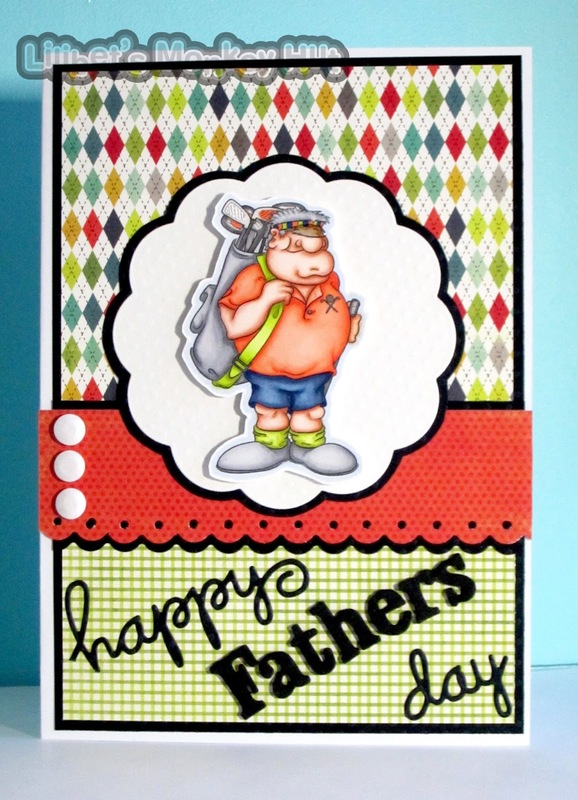 They are perfect for all the Dads and Lads cards! 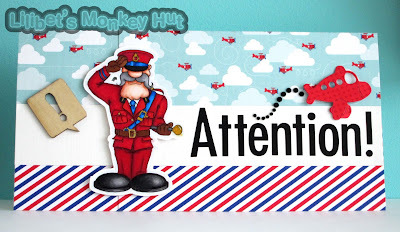 If you would like to see the full card recipe pop over to my Blog and say "Hello"
Right now I have to go and see my Dad and if I'm lucky the parents might make me brunch!! Well, the magic lamp has granted your wish....it's the weekend again! 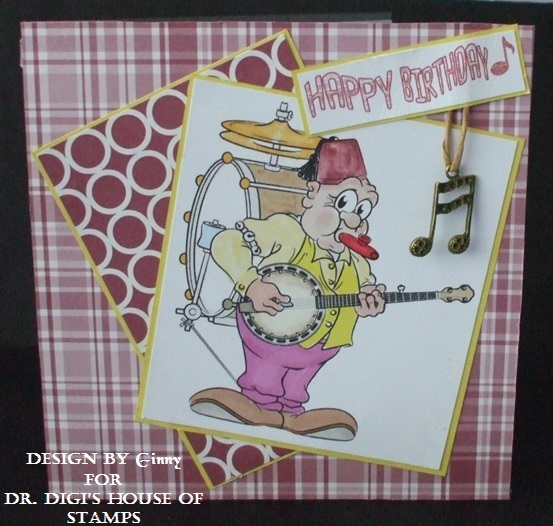 Here we go with another image from Dr Digi's House of Stamps, titled I Dream of Genie. 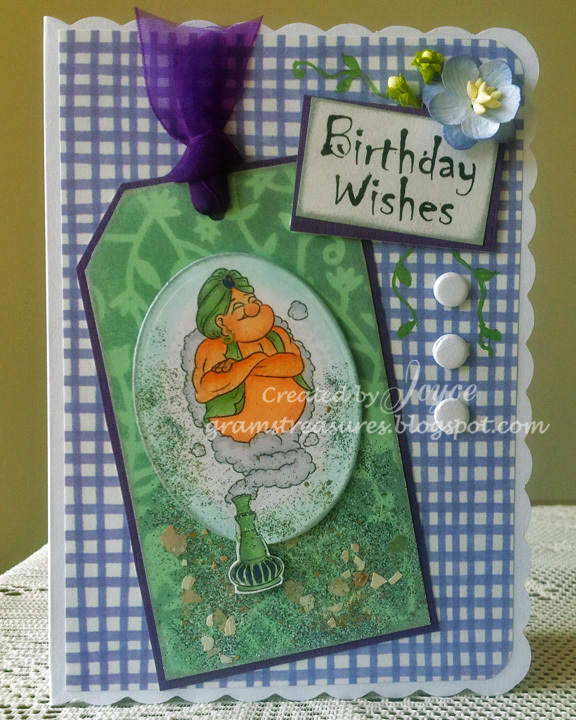 It's sure to bring a smile and what better way to send Birthday wishes. Pop a bit of money inside, and I bet one of their wishes will at least come true! You know how it is, man comes home from a tiring day at work, the dog greets man like a long lost friend at the door, he dashes off to find man his slippers and man settles down in his comfy armchair with the paper and his pipe! Not anymore, man's dog has had a tiring day chasing his tail and running in his dreams, so man's dog gets comfy in the old armchair and man should be very, very grateful that his slippers haven't been chewed! An old classic - the Ford Popular and convenient timing just for Father's Day! See what I did there with the 'pop' bit?! You too can amuse your creative talents with the digi from the store and it won't break the bank at only £1! Well, they say, if you're not a kid, you're a wizard! 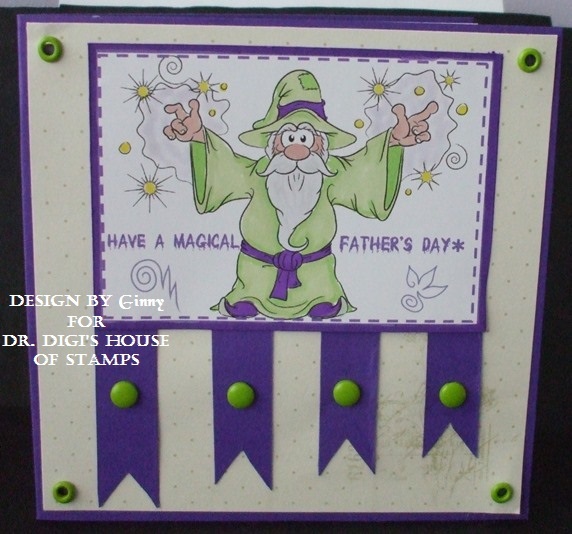 Wizz Doodles from Dr. Digi's House of Stamps will be a big hit to whoever you send him to, he is ready to cast a little Father’s Day magic. This is Hole in one Hal. 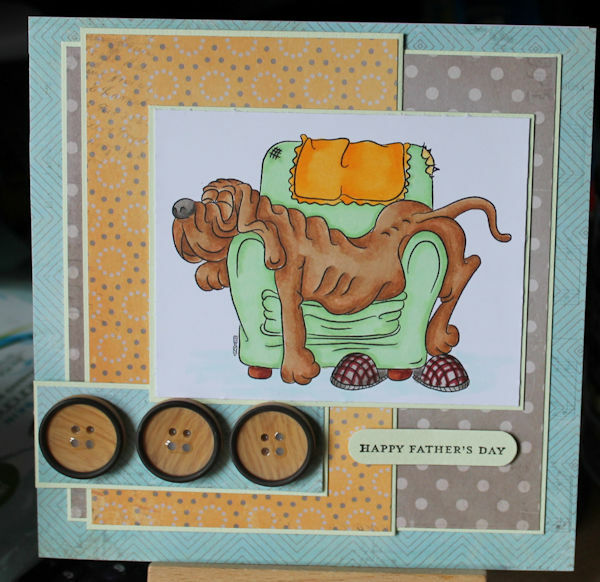 I'm cracking on, trying to get ahead and get some Fathers day cards done. This one I've made for the soon to be Father in Law. (Less than a year till we get Wed...!) He likes his golf but doesn't get much chance to play. All the boys in both families play golf and they have an annual tournament but the cheating that goes on is terrible! We are all pretty competitive - after all Second place is first loser!! I'm hoping this will be the best Fathers Day card he will receive!! 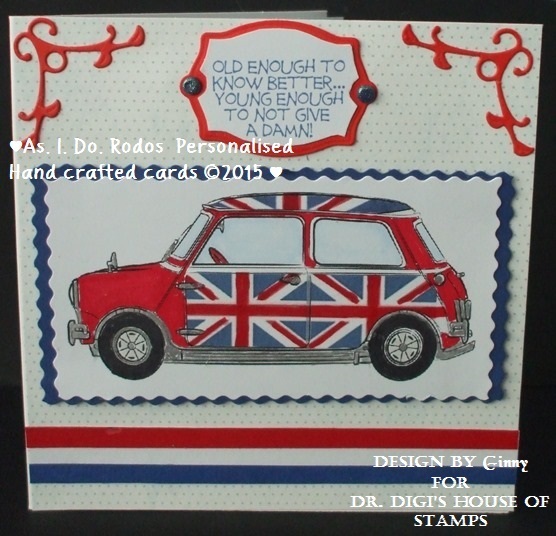 If you would like to see the recipe for this card - pop over to my blog, where all the colours are listed too. 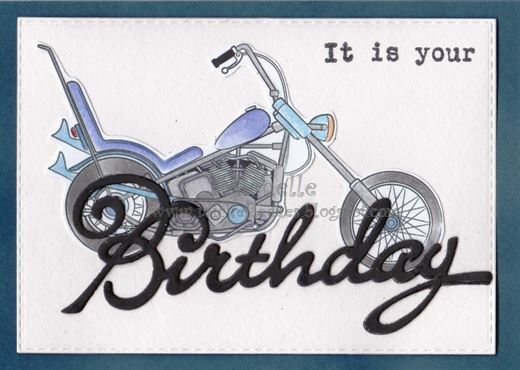 So I made this Harley Davidson for his birthday. I like the image a lot it shows so many details. 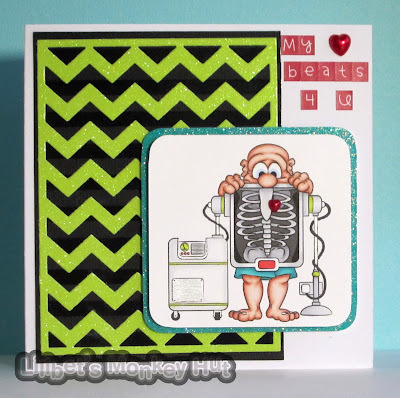 Like to know how I made the card read it on my BLOG. HERE can you find lot more nice digi's. Falderee, faldarah a knapsack on my back. 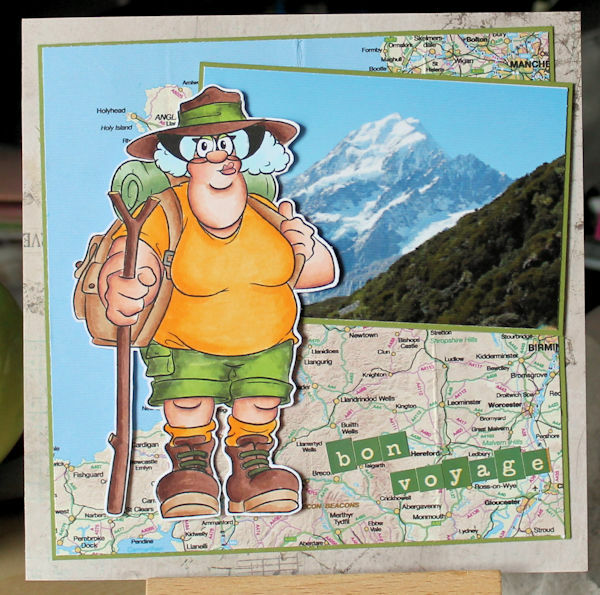 Faldaree Deirdery is setting off for a trek up a mountain, something she likes to do at the weekend, personally I am more into lies in, copious quantities of tea and a takeaway at the weekend! You can find Faldaree Deirdery HERE. Hope you have a good weekend, whatever you choose to do! Not a pretty sight, but at least the furry monster slippers match the cuppa. And as Father's Day is rapidly approaching, Weekend Walter is the perfect image to that perfect guy. Wow its Sunday morning again already! These weeks are flying by too quickly. Today Im showing you Dunderton Academicals FC and Balls. I used the balls to change the image from a Football player to a Rugby Player. 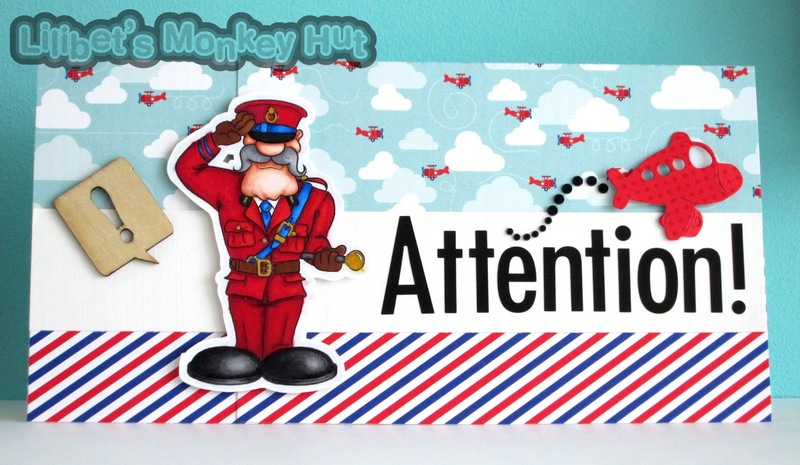 I'm trying to get ahead and make some Fathers Day cards ready for 21st June. 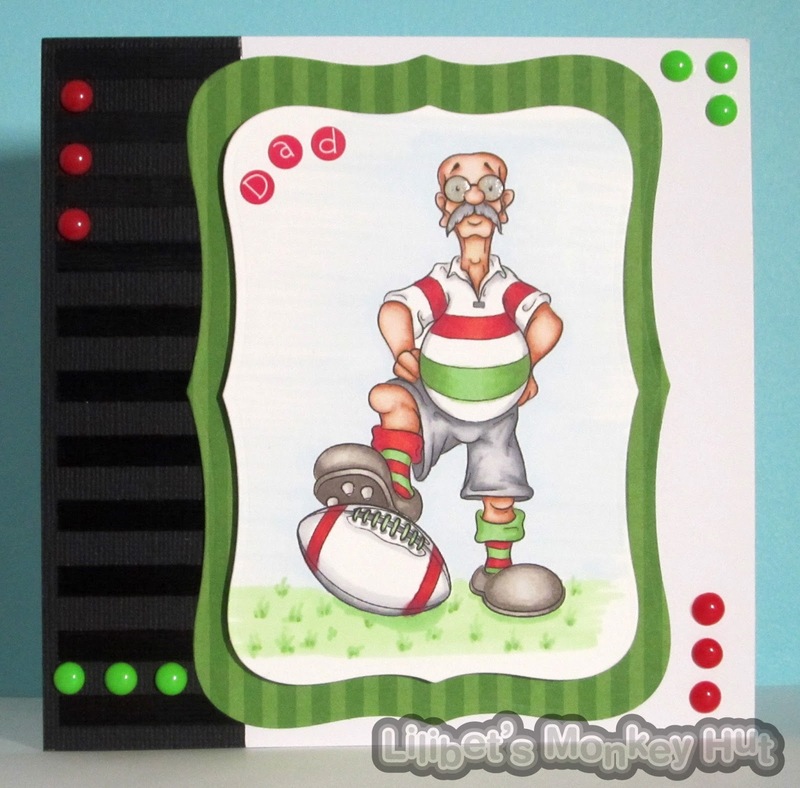 I made this one with my Dad in mind - Who played rugby well into his 50's. Now at 70 - its a more sedate affair of Bowls! I have many happy memories of days spent hanging around the rugby club watching Dad play whilst the Mum were in the club house cooking up Pie and mash. I've made this card in the team colours and Derek looks more like my Dad today rather than back when he was playing! 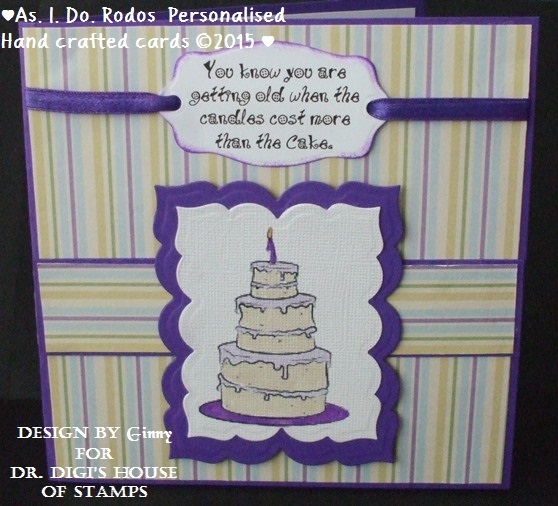 If you would like to see the card recipe - pop over to my blog where even the marker pens used are listed. 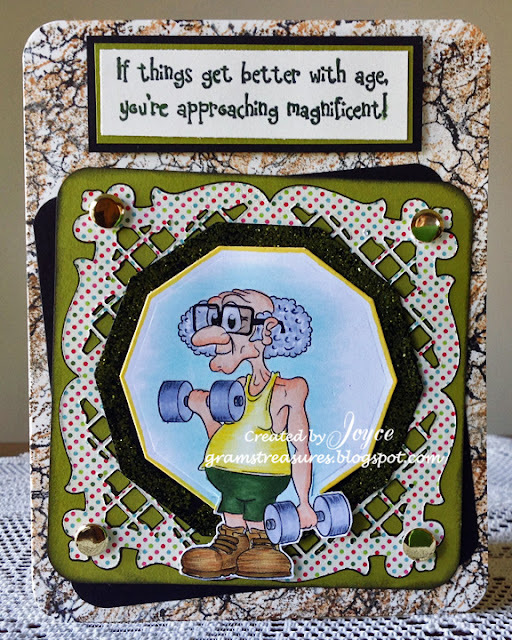 Today I have a card with Keep Fit Kenneth, from Dr Digi's House of Stamps. I actually have a brother by that name....hmmm. With summer fast approaching, it's time to find out those weights and buff up a bit. Kenneth wants to look his best for the summer reveal, and also hopes to fit into his summer clothes from last year. Oh dearie me, Raymond has come a cropper, never one for taking things slowly, Raymond was on his space hopper, racing down the high street, when he accidently bounced onto a mattress, on display at the local bed shop, and catapulted himself straight into the display next door at the greengrocers. It was carnage aubergines, quince and squash went everywhere (Raymond lives in a posh area it has to be said). Never mind it looks like he has come away pretty unscathed. Sometimes its the small things that make us smile. Mini Coopers do that. And nice and simple cards that just happen to fall together. I'd like to think by magic, but it's probably more luck and good fortune! I have just made a spiced sultana cake and it smells delicious can’t wait for it to cool down!! Anyhooooo it gave me an idea for this week’s card Cake and Candles This is such a versatile image you can have fun with it.